At this point, Ross presented the slide that has a famous quote of T.S. Eliot as they continue to talk about finding the right direction in undertaking asset management. Thanks, Ross. Really one of my favorite quotes from T.S. Eliot, “If you don’t know where you’re going, any road will take you there” and certainly that’s very true with infrastructure asset management. Over the years we’ve seen some authorities, councils, and municipalities taking different directions through their asset management journey. And really some of them – we don’t know where they’re actually heading and if they have any form of strategy. Like a yacht race in the way, why you have to pick backward and forwards from one side of the bay to the other if you actually don’t know where the finish line is. All of that could be but waste if you don’t know where you’re heading. So knowing what you’re trying to achieve is really the first point that we think is important to highlight this morning. And that’s where I think one of the areas that’s been particularly helpful here I suppose we have looked in the asset management policy. What is the target that you got in mind? How complex this business needs to be for you? And what do you actually want to achieve? 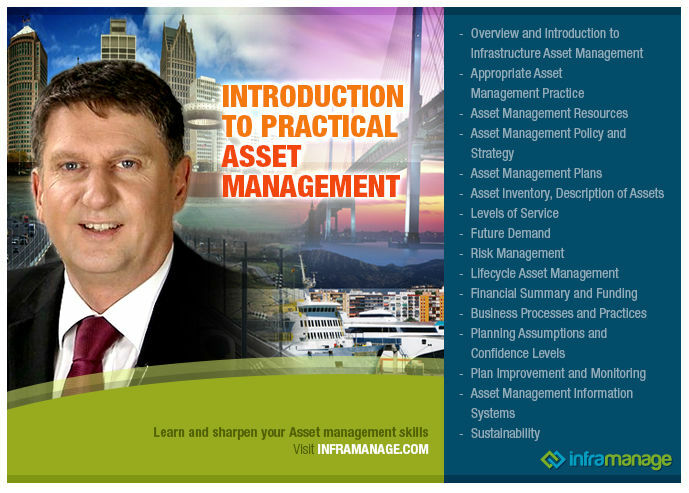 And interestingly in New Zealand terms, the asset management journey started back in the mid-1990s, coming off the back of a large and nasty recession that New Zealand went through at that time. We had a legislative requirement, and the legislation at that time had a law that required all the municipalities that were owning assets, required they had focused on sorting out rehabilitation renewal cost because that was where the gap seemed to be. The legislation has been modified over time, but, one of the things with knowing where you’re’ going is, the reason I’ve mentioned the legislation or the law is you will have a federal, states, local ordinances, laws and regulations, you might have permits or licenses if you are in the water or wastewater activities. If you’re into transportation, for argument sake, in the US, you have federal highways requirement and on it goes, or state requirements. So, one of the things is very early on is sorting out what the legal framework you’re operating within is, and making sure you got those spaces covered. It helps set that direction. And some people get bogged down Ross, do you think? Where they’re actually are so concentrated on the detail that they actually do forget what they are trying to achieve. They do, I think you can get, that’s like anything, walking in the forest, you can get lost in the trees or lose the path. But any asset, any authority in the public sphere is going to be operating within a regulatory and legislative environment that’s often quite prescribed. Given that they’re often monopolies and quite regulated. So you do need to know that. But I think you don’t, you’re quite right Grant, and you don’t want to get bogged down on the minute of regulatory details.